Last week, delegates and visitors at the Republican National Convention in Tampa helped themselves to 1,250 free rides on a bicycle bus — a sort of communal bike-share system called Freewheelin, sponsored by health insurance company Humana. According to the Freewheelin website, those RNC attendees logged 542 miles on the 20 free pedal-buses, burned 18,137 calories, and reduced their carbon footprint by 596 metric tons. Even Mayor Bob Buckhorn was inspired. “I think I’m going to trade in the big, black SUV that we took from a pimp and make this the new Mayor Mobile,” he said. 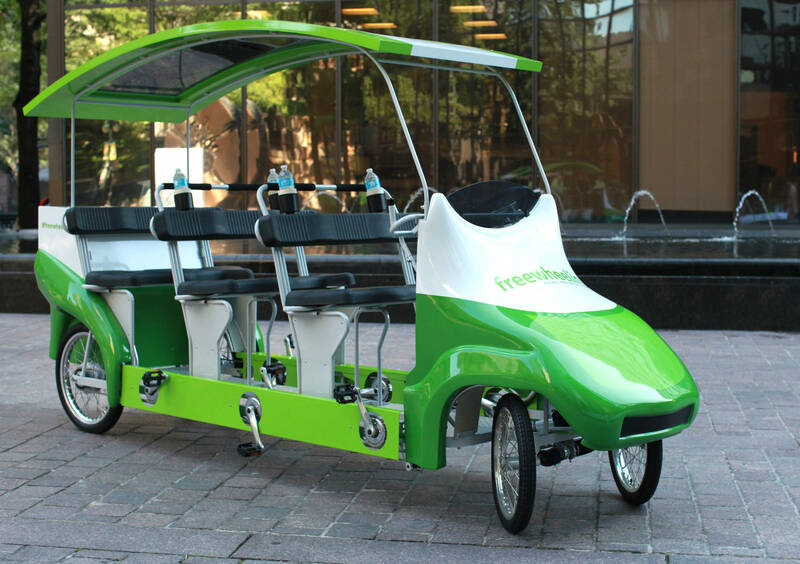 Freewheelin is in Charlotte this week, providing a clean and efficient mode of transportation for people attending the Democratic festivities. “As President Obama and other Democratic candidates gather together to announce their platform for change in America, a quiet but important transportation revolution will be happening right outside,” gushed writer Beth Buczynski in an article for EarthTechling. Freewheelin also set up fruit carts and free health screenings. The system evolved from the bike rental system Humana set up at the 2008 conventions. At the moment I’m writing this, the Democrats have out-ridden the Republicans, logging 1,333 trips and well over twice as many miles. Is Charlotte’s convention complex more sprawling than Tampa’s, or do the Dems just have more places to go? Or maybe the Republican attendees just wanted to try out a quick spin but the Democrats were more utilitarian, using the system to get from place to place? Either way, it equates to 43,176 calories burned and 1,438 metric tons of carbon saved. Perhaps taking the pedal-bus through congested streets around the streets of the convention centers will remind both parties that active transportation is often the most efficient, as well as the healthiest and most fun, form of transportation. Will Dallas Climb Out of the Bike-Friendly Cellar?